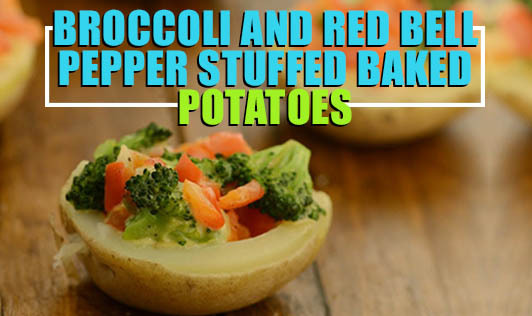 Broccoli and red bell pepper stuffed baked potatoes are extremely easy to prepare and make for a delicious healthy starter for your parties. Both broccoli and red bell peppers are rich sources of vitamin C. They are also some the richest sources of sulfur, an important micro-mineral that lends the veggies their anti-cancer property. Do you need more reasons to try this recipe? Read on. Heat a nonstick pan and add butter, garlic, green chilies, broccoli, and red capsicum. Saute on a medium flame for 2 to 3 minutes. Add the fresh cream, salt, and pepper, and cook on medium flame for 2 to 3 minutes. Remove from the flame, add processed cheese, and mix well. Divide the mixture into 8 parts and keep aside. Boil the potatoes and cut each horizontally in half. Scoop out the potatoes using a spoon to create a hollow depression for the filling. Season the potatoes with some salt and fill the potatoes with the stuffing. Place the potatoes on a baking tray and bake them in a preheated oven at 200°C for 5 to 10 minutes or until the cheese melts.